NEW ORLEANS — When Jenny Barringer stood on the stage at the Orlando Grande Lakes Resort in 2009 and was the first person to accept The Bowerman Award, little did we know she’d be an Olympic bronze medalist seven years later. The same could be said for Galen Rupp — the male recipient that year — and the medals he won at back-to-back Olympic Games. Rupp wasn’t the only former winner of The Bowerman Award to nab medals in London and Rio. Derek Drouin (2013) and Ashton Eaton (2010) also joined him in that regard. Eaton holds a special distinction of being a two-time gold medalist in the decathlon, while Drouin captured bronze in 2012 and gold this past August in the high jump. The female winner in 2013 was Brianna Rollins and this past August was remarkable for her as she won gold at the 2016 Rio Olympic Games in the 100 hurdles. Let’s not forget about Deon Lendore (2014) either. Lendore won bronze in 2012 as part of Trinidad and Tobago’s 4×400 relay team. All told, six former winners of The Bowerman Award have combined for 9 Olympic medals — 5 in Rio and 4 in London. And what do you know: There are 9 days left until we crown two new winners of The Bowerman Award on December 16 at the Orlando Grande Lakes Resort as part of the USTFCCCA Convention. The ceremony starts at 7 p.m. ET and will be broadcast LIVE on FloTrack.org. 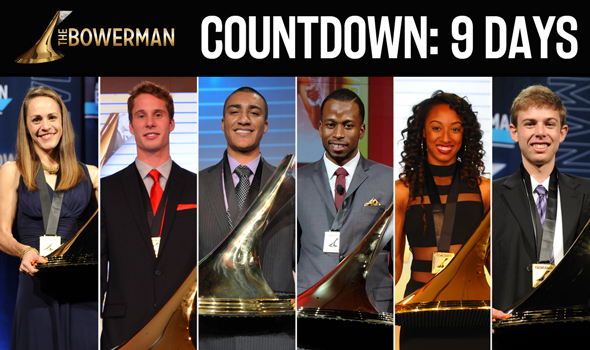 Be sure to check back on TheBowerman.org for much more about The Bowerman Award in the upcoming week. Past winners include two-time Olympic gold medalist, five-time World Champion and decathlon world-record holder Ashton Eaton (2010), two-time Olympic medalist Galen Rupp (2009), Olympic bronze medalist and 2011 IAAF World Champion at 1500 meters Jenny Simpson (2009), Olympic gold medalist and 2013 100-meter hurdles World Champion Brianna Rollins (2013) as well as two-time Olympic medalist in the high jump and 2015 World Champion Derek Drouin (2013).